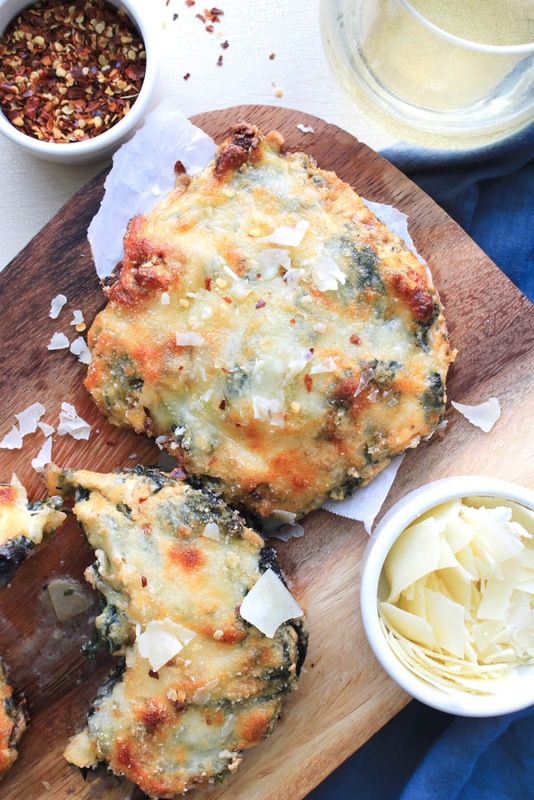 Spinach and Cheese Stuffed Portobello Mushrooms make a rich and decadent side dish or light main dish! 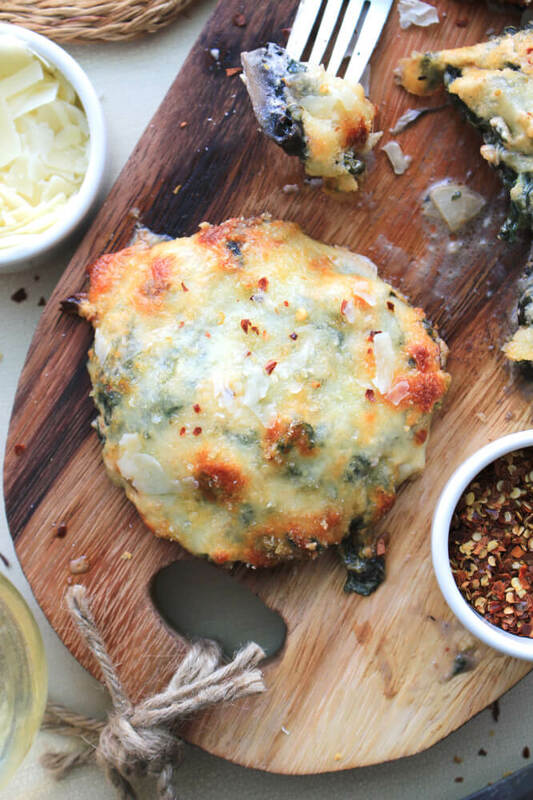 The creamy, cheesy filling paired with the earthy mushrooms is ridiculously good! Mushrooms are one of those foods that I buy almost every time I go to the grocery store. If you're a mushroom lover like me, mushrooms are on par with bread and milk as far as fridge staples go. When I put them into my cart, I may not know what recipe I'll be using them for or how I'm going to prepare them, but one thing that I definitely know is that they won't go to waste. I can easily add mushrooms to my breakfast, lunch, or dinner! My usual mushroom m.o. is to buy white button mushrooms or baby bellas, but lately, there's something about big, meaty portobello mushroom caps that I can't resist. 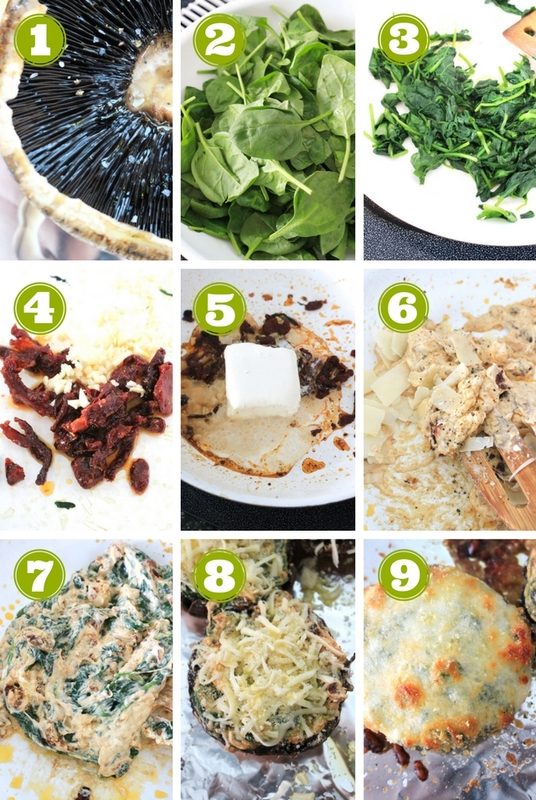 I love to throw them on the grill to make vegetarian mushroom burgers and incorporate them into filling casseroles like Five Cheese Mushroom Lasagna. I am addicted to their hearty texture and that earthy shroom flavor! I've been dying to make stuffed mushrooms with some portobello mushroom caps and I'm happy to report that I've finally gotten around to it! 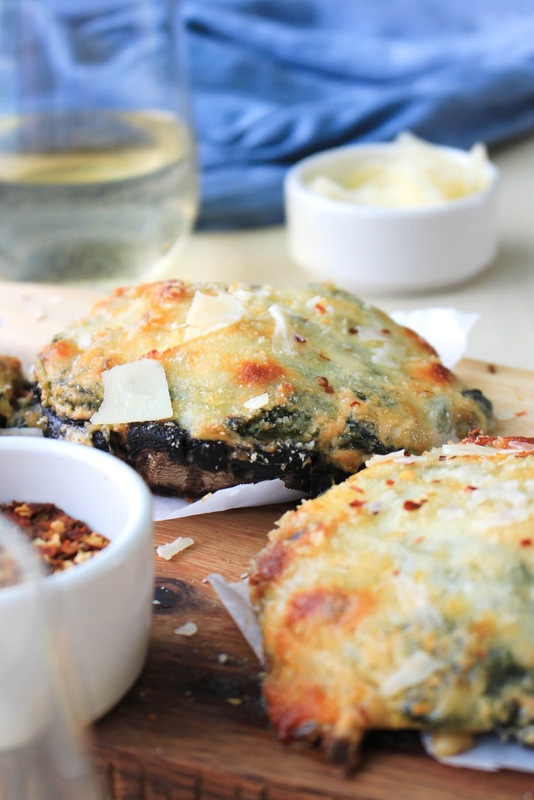 I've been dreaming about this stuffed mushroom recipe for quite some time now. I adore making (and eating!) bite-sized stuffed mushroom appetizers like my Bacon & Cheddar Stuffed Mushrooms and Three Cheese Stuffed Mushrooms and I couldn't wait to null the idea! 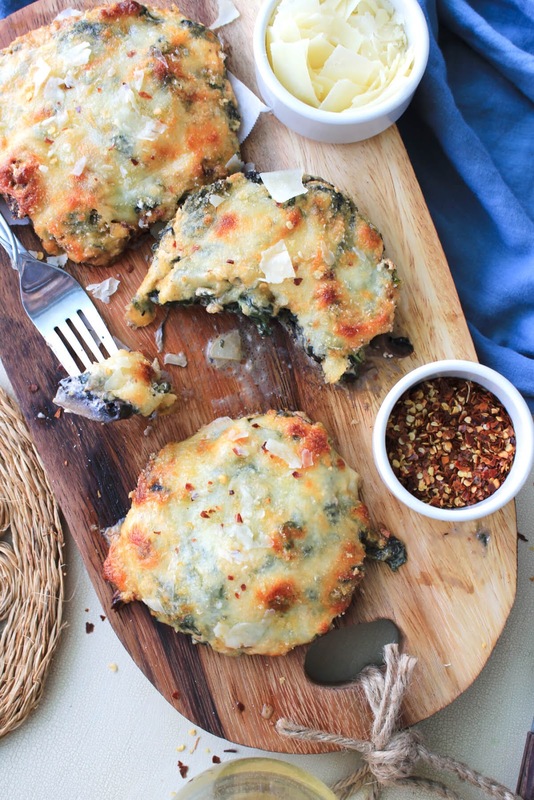 I filled my portobellos with a rich, cheesy filling packed with fresh spinach and sun-dried tomatoes. I baked them in the oven until the mushrooms were tender and the mozzarella panko topping was gorgeous and golden. They were everything I hoped they would be and I may or may not have scarfed two of them down as soon as this I finished taking these photos! This hearty stuffed mushroom recipe would make a fabulous side dish served alongside a nice big steak or, if you're really into mushrooms like me, they make the perfect lunch or dinner all by themselves. I hope you love them as much as we did! And one more thing before we get to the recipe, I'd like to give a big thank you to my mom for the beautiful new cutting board featured in the photos above. She bought it for me for my 39th birthday last week and I couldn't love it more. Thanks, Mom! 1. Preheat your oven to 350 degrees. In a large skillet, saute the spinach with 2 tablespoons of water over medium-high heat until just wilted. Remove from the skillet and set aside. 2. In the same skillet, cook the sun-dried tomatoes and garlic for 1 minute, stirring frequently. Add the white wine to the skillet and continue cooking for an additional minute. Reduce the heat to medium and add the cream cheese and heavy cream. Stir until the cream cheese is melted. Add the reserved spinach and parmesan cheese to the skillet and stir to combine. Remove from the heat. 3. Place the mushrooms onto a foil-lined baking sheet. Drizzle the mushrooms with olive oil and season with salt and pepper. Fill the mushroom caps with the spinach and cheese mixture and top with the shredded mozzarella cheese. Sprinkle with the panko breadcrumbs and lightly drizzle with a little more olive oil. 4. Bake in the preheated oven for 20 minutes. Top the mushroom caps with a sprinkle of crushed red pepper and serve. These make an excellent side dish or a vegetarian main dish! There will be enough filling to stuff 3-4 mushroom caps, depending on their size.